Whenever I get a chance to research I get a lil elated. To give you context, in undergrad, I studied for a semester at the Newberry Library in Chicago and wrote an 80-page-paper on the Mexican Revolution of 1910 and how the US press portrayed the Zapatista rebels. I am, without a doubt, the coolest human. So, when I started my Youth Services job a year ago, I was given storytimes for babies and one-year-olds and I went on the research hunt to borrow and create my own structure for storytime. I was PUMPED. You can check out the structure I came up with on my Stop…Baby Time post and the revised storytime at the Ya’ll Can’t Stop These Babies post. At the beginning of each storytime, I focus on one of the 5 Every Child Ready to Read (2nd edition) practices: singing, playing, talking, reading, and writing. I’ve compiled a list of quick tips from a variety of sources including: the ECRR 2nd edition handbook, Saroj Ghoting’s What Can I Say? and Handouts and Activity Sheets, Talk to Me, Baby by Betty Lynn Segal Bardige, Developmental Tips from Websites from Mother Goose on the Loose, The Importance of Play from ALSC, and several more resources that are alluding me at the moment. So now I share to you my extensive list of ECRR 2nd edition tips for caregivers of children ages 0-2. Even though young children don’t understand the meanings of rhymes, it is important for them to hear them. By 6 months babies are already able to recognize the sounds of language and rhymes help introduce different forms of the language. Singing slows down language, allowing them to build vocabulary and identify that language is made of parts. Songs and rhymes help children distinguish similar words based on their sound. Sing songs about everything. Washing the dishes? Sing about it! Changing a diaper? There’s a song there too (whoop-de-doop rhymes with poop)! Learning nursery rhymes is an important literacy skill. Studies have shown that children who have memorized some nursery rhymes before they start kindergarten will be more successful in school than children who do not know nursery rhymes. We often do bounce rhymes in Book Babies. Bounce rhymes provide several positive experiences for babies. The steady beat with the whole body lets babies feel the rhythm of language with their bodies. The physical contact of an adult and baby also reinforces positive emotions. And bouncing is joyful and fun! The way you bounce a baby will change over time. When you bounce a young baby you will do it very gently and make sure the baby’s head is supported, as the baby gets older you can make the bounces bigger and bouncier but always remember to do what feels safe for your baby. Singing together has been proven to increase cooperation. Vocalizing and moving together in time strengthens their ability act together as a unit. Nonfiction, fact-based books are particularly helpful for babies as they begin to attach words to everyday objects. You can go further by finding a real object from the book and showing them afterwards. You are helping them realize that pictures represent real things. Choose books that YOU enjoy because your child picks up on your feelings. Tell your child that you enjoy the book. Although reading the same book for the tenth time might be a drag for you, your child learns by repetition and their brain NEEDS it. Perhaps that will help as you read it yet again. 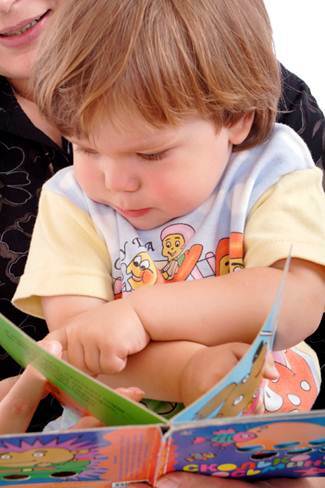 For a baby’s short attention span, reading shouldn’t be done in one sitting but throughout the day. That’s why it’s important to always keep a book handy. Read when you and your child are relaxed and happy. Reading should always be an enjoyable experience. If your child starts to lose interest, return to the book later. If you don’t, your child could start associating negative feelings with reading. Associate reading with fun by keeping a few books in your child’s toy box. When you read to your baby, don’t just read the words. Talk about the pictures. Describe what is going on. Reading helps build vocabulary. Children’s books have 3 times more rare words than everyday talking. Allow your child to participate in the reading experience, even if they can’t read. Let them turn the page. Ask them what is on the page. Point to the word they identify. Choose a long word from a book and clap out the syllables. It is natural for babies to bite on books. This is how they learn about their world. You can gently take it away, without scolding, and open the book to show her the pictures. Hold a book upside down and talk about how you can’t read it. Ask your child to help you turn it right-side up and explain that you can read it now. Before you begin a book, look at the cover and predict what the book is about. Ask questions as you read. Let your child take the lead when it comes to reading. If your baby doesn’t want to read a book, just set it aside and come back to it later. It’s best not to make reading a power struggle but rather to make it a pleasant experience that your baby will learn to love. Keep photo albums or scrapbooks of family events. As you look through them with your baby, tell the story of what happened using a beginning, middle and end. Every once in a while as you read a book with your baby point to a word or a phrase. Very gradually over time your young child will begin to associate the print on a page as a spoken word. Predictable stories are essential in the earlier years. Well-read to children develop a set of expectations of how stories are told which enhances their understanding, allowing knowledge to be easier to access. Children with a rich knowledge base find it easier to learn and remember. Long before babies talk, they use gestures and movements to express themselves. The rhymes we are doing in class are perfect ways to pair sounds with movements. By using specific names for things, like cat and kitten, you help your child learn new words and you help them understand differences between similar things. Even though your child may not be able to talk, it is crucial that you speak to him or her. This exposure builds vocabulary and shows your child that speaking is fun, giving them a desire to imitate. Talk with your baby about what you are doing and what is going on around you. Go beyond the words in a story. Describe the pictures you see. Ask where an object is, wait, then point out the object. 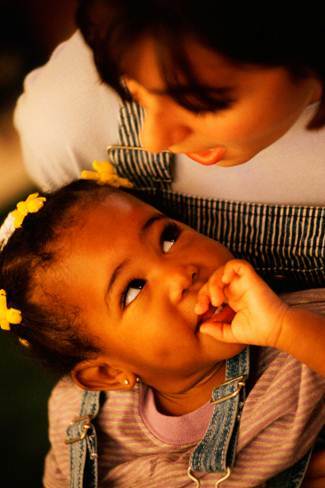 If English isn’t your first language, speak to your child in the language you know best. 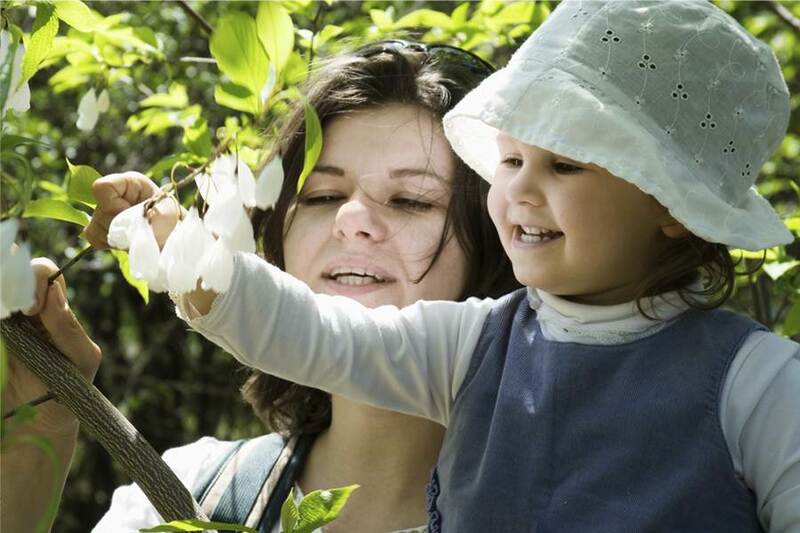 This allows you to explain things more fluently so your child will learn more. Children are able to comprehend words spoken to them before they are able to produce them on their own. Sign language is an excellent way to allow your child to speak with you before their vocal chords are fully developed. Business talk (initiations, commands, prohibitions) is used equally amongst parents but the striking differences are in the amount of additional talk–conversation, running commentary, storytelling, wordplay, chit-chat, explanation, and thinking aloud. Business talk is important in setting guidelines and teaching but play talk adds an extra dimension. If you’re not a natural storyteller, books are great places to start. They are full of complex language and decontextualized language which is talk that goes beyond the here and now. Talking and engaging with your child is infinitely more powerful than tv because it is responsive, more interesting, and emotionally affirming. Babbling is the same for all babies the world over. Over time these sounds are narrowed to the sounds of the languages that surround them. By 10or 12 months he will be talking a gibberish that mimics the cadences of the language. The most interesting questions are the ones whose answers the questioner doesn’t know I’m advance. Eg. What would you like to play today?, What do we need for our tea party?, where do you think that plane is going? Letters are made of shapes. By learning different shapes, young children are on the fast track towards learning letters. Young children learn through their senses. Give them opportunities to feel different textures and shapes. Understanding differences between objects is the best way for babies to develop early-writing skills. Scribbling and finger painting leads to developing fine motor skills like grasping a crayon and creating a picture. Circle crayons are a perfect way for babies to create artwork with their hands. Have your baby finger paint in the tub before a bath. Large foam letters are a simple way to introduce your baby to the different angles and shapes of a letter. The most important word to a child is his or her name. It is an excellent way to show children that letters and words describe something—themselves! Talk to your children about what they draw and write captions or stories together. This helps make a connection between spoken and written word. Give your child plenty of playtime. Some of the best kinds of play are unstructured. Even from birth, babies are playing. They use play to learn about their world. A baby may grab onto a rattle that you offer and shake it. At first he doesn’t realize that by moving his arm, he is making the rattle make a noise. Over a few months he will be making the connection between his own actions and what is happening around him. Playing peek-a-boo is a little game that helps babies learn that what disappears is still there—object permanence. When you think about it, each page turn of a book is a kind of peek-a-boo, each turning of the page reveals a little surprise. By describing what is happening as you play with your child, by talking about colors and shapes, even if your child does not yet understand all you say, you are helping your child develop language and laying a strong foundation for later reading. This is so fabulous! Seriously, you just made my storytime planning so much easier! I agree Brooke, what a great resource. THANK YOU! Thank you , Thank you, Thank you!! I started a Baby storytime program in May and every week it has been such a challenge to identify and/or modify early literacy tips for my babies. This will make my weekly planning so much easier. Thank you, what a wonderful compilation of developmental tips! This is so excellent! I especially appreciate the writing section as I don’t currently have anything like that in my baby story time sessions that I do. Thanks for putting this all together! LOSING MY MIND WITH JOY. I am moving to a new library soon and am utterly THRILLED to discover this post since I know I can use it! Thank you, this is a wonderful resource.